The animations are un-intimidating and hand-drawn. 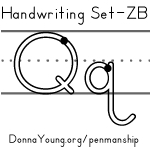 Lowercase letter q can be drawn with or without a pencil lift. The animation that I made for this set is a one-stroke q (no pencil lift). Uppercase Q is taught using one pencil lift to "cross" the bottom of the circle. A new organizer - This is "SW" (skinny weekend), this 1 page per month block calendar utilizes the margins for the weekend days to allow more room for the week. Big Cal uses 4 sheets of paper per month. When assembled, Big Cal can be pinned to a corkboard. The finished size is approximately 21 inches wide by 16 inches tall.